Paul Weigel, Ph.D., obtained his B.S. degree in Chemistry from Cornell University and his doctoral degree from The Johns Hopkins University School of Medicine in 1975. He joined the University of Texas Medical Branch at Galveston as an Assistant Professor in 1978 and became a Professor of Biochemistry and Cell Biology in 1987. Since 1994 he has been Professor and Chairman in the Department of Biochemistry and Molecular Biology, College of Medicine, at the University of Oklahoma Health Sciences Center in Oklahoma City. Dr. Weigel has made substantial research contributions in several fields, including the discoveries of multiple coated pit pathways for receptor-mediated endocytosis and of the enzyme responsible for hyaluronan biosynthesis. He has had a long-standing interest in the biochemistry and the biology of hyaluronan. His group was the first to identify and isolate the gene for hyaluronan synthase. Dr. Weigel's laboratory also developed the use of structurally defined iodinated hyaluronan oligosaccharides of high specific radioactivity to detect and to study specific hyaluronan receptors and binding proteins. This approach has recently enabled his laboratory to purify the liver endothelial cell receptor that removes circulating hyaluronan fragments from the blood by receptor-mediated endocytosis. Although it may seem strange that some bacteria can make the samehyaluronan polymer that mammals make, these microorganisms havecreated a clever way to live a pathogenic life-style. As shownin Figure 1, bacteria such as Group C Streptococcus equisimilis (a pathogen in animals and sometimes humans), Group A Streptococcus pyogenes (a human pathogen), and Pasteurella multocida (an animal pathogen) are able to hide from the immune systemsof their hosts by surrounding themselves with a thick layer ofhyaluronan. Since this hyaluronan barrier, or capsule, has thesame structure as the hyaluronan in our tissues, the bacteriaare not easily recognized by antibodies or attacked by phagocytes.Studies have confirmed that the hyaluronan capsule contributesin large part to the pathogenicity of these bacteria (Fig. 1). Fig. 1　The hyaluronan capsule of Group C Streptococcus cells. 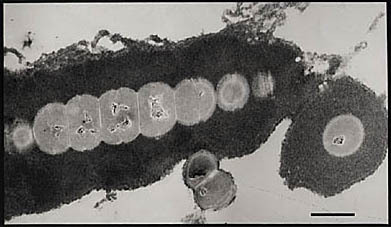 The electron micrograph shows a chain of Streptococcus equisimilis bacteria, and a single bacterium at the lower right, surroundedby a thick layer of hyaluronan. The bar represents 1 micrometer,approximately a 27,000-fold magnification. Typically, the hyaluronancapsule is one to three times the diameter of the cell body. The anionic hyaluronan was visualized with cationic ferritin particles (〜10 nm) containing electron-dense iron cores. Despite the advantage gained by a pathogenic bacterium able tomake a hyaluronan capsule, only about six species of bacteria(out of many thousands) have acquired this biosynthetic ability.Perhaps considerable disadvantages exist for these bacteria aswell. One disadvantage, discussed in section IV, can slow downcell growth directly by inhibiting cell wall production. Anotherfactor is that the large hyaluronan capsule represents a greatmetabolic burden. The sugar units used to assemble this capsulecould be used instead to fuel the growth and division of the bacterialcell. Not all types of bacteria may have the metabolic capabilityto sustain their growth while they use a large fraction of theircarbohydrate and energy metabolism for capsule production. Although we do not know how some bacteria acquired their hyaluronansynthase gene and other genes related to hyaluronan biosynthesis,it is tempting to speculate that the close similarities betweenthe streptococcal and eukaryotic enzymes are not a coincidence.It is likely that a bacterial ancestor to the present day Group A and Group C Streptococcus species incorporated, from a eukaryotic host, a eukaryotic copyof a primitive hyaluronan synthase gene as well as primitive hasB and hasC genes (discussed below). Historically, the first cell-free studies of hyaluronan biosynthesisused Group A streptococcal bacteria. The pioneering work of Dorfmanand coworkers in the 1950s and 1960s showed that the streptococcalhyaluronan synthase was located in the cell membrane, requiredMg++ ions and used the two sugar-nucleotide substrates, uridine diphospho-glucuronicacid (UDP-GlcA) and uridine diphospho-N-acetylglucosamine (UDP-GlcNAc), to polymerize a hyaluronan chain.5 Subsequently, however, these and many other workers were unableto solubilize the enzyme in an active and stable form or purifyit successfully. Similarly, eukaryotic hyaluronan synthases havenot yet been purified. Our isolation of the Group A6 and Group C7 streptococcal hyaluronan synthase genes has now led to the expressionof these proteins in large amounts in Escherichia coli. Finally, 64 years after the "birth announcement" of hyaluronan,1 the enzyme that makes hyaluronan, the hyaluronan synthase, hasbeen purified.8 Although the two streptococcal hyaluronan synthases are verysimilar, the hyaluronan synthase from P. multocida is quite different structurally. Only the streptococcal enzymeswill be discussed in this article. Virtually all of the enzymes we know about catalyze a reactionthat uses one or two (or more rarely, three) substrates to produceone or two products. The hyaluronan synthase enzyme family isunique among the known enzymes. The hyaluronan synthase has two different enzymatic activities (i.e., glycosyltransferases) within the same enzyme, and the hyaluronanproduct after each sugar addition becomes a substrate for thenext sugar addition. Hyaluronan synthases are also membrane enzymes.The overall reaction for the synthesis of one hyaluronan disaccharideunit1,3 is shown below (where n is the number of disaccharide units). Although it seems straightforward, the enzyme must possess at least six different functions to perform this reaction, as shown in Figure 2! Numerous questions about the details and mechanism of this complex reaction can be answered now that the streptococcal hyaluronan synthase enzymes have been cloned and purified (Fig. 2). Fig. 2　Enzyme functions needed for hyaluronan biosynthesis. The diagramshows the membrane-bound hyaluronan synthase and the six independentactivities required for the enzyme to make a disaccharide unitand extend the growing hyaluronan chain. Before it is released,the chain can grow to more than 40,000 monosaccharides, correspondingto a mass of more than 8 million Da. The sugar-nucleodtide substratesare produced and used by the synthase inside the cell, and thehyaluronan chain is continuously transferred (translocated) sothat it is extruded into the exterior of the cell to form thecapsule. In order for Streptococcus bacteria to synthesize a hyaluronan capsule, three differentgenes must usually be present. These three genes, which encodethree different enzymes, are arranged in an operon, shown in Figure3, designated the hyaluronan synthesis (or has) operon. Two of the enzymes are needed for the cell to producelarge amounts of the two UDP-sugar precursors, and the third enzymeis the hyaluronan synthase, encoded by the gene designated hasA. UDP-Glc dehydrogenase (designated hasB) is required to make UDP-GlcA, one of the two substrates neededfor hyaluronan synthesis, from UDP-Glc in an oxidation reactionthat utilizes 2 NAD+. UDP-Glc pyrophosphorylase (hasC) is an enzyme that creates UDP-Glc from UTP and Glc-1-phosphate (Fig. 3). Fig. 3　Arrangement of the streptococcal genes for hyaluronan biosynthesis. Each arrow represents a gene in the bacterial genome that is transcribedin the direction of the arrow. The has operon contains three coordinately controled genes designated A, B and C. In Group A Streptococcus, the genes for recombination protein F (recF), inosine-5'-monophosphate dehydrogenase (guaB) and an unknown membrane protein (memX) are near the has operon. Since UDP-Glc is the precursor from which all the other sugar-nucleotidesare made, the amount of UDP-Glc produced by a cell will regulatethe total amount of all the cell's sugar-nucleotides. Bacteriathat make hyaluronan capsules have two different genes for this pyrophosphorylase enzyme: one to supply the normal metabolic needsof the cell for sugar-nucleotides, and the second, hasC, to increase greatly the total amount of cellular sugar-nucleotidesand thereby support synthesis of the large amount of hyaluronanin the extracellular capsule. Only one copy of the hasB gene product must be present to provide the amount of UDP-GlcAneeded for hyaluronan synthesis. If the bacterial cells did not greatly expand their sugar-nucleotidepool, the very active hyaluronan synthase would make hyaluronanand deplete the cell of UDP-GlcA and UDP-GlcNAc. Since the latteris also needed for cell wall synthesis, such depletion would stopthe cell from growing. This, in fact, occurs when the streptococcalhyaluronan synthase gene is expressed in another bacterial speciesthat produces the two substrates for the hyaluronan synthase,but lacks the additional enzyme (hasC) needed to enlarge the sugar-nucleotide pools. Such cells donot grow well. To overcome this problem of poor cell growth, we express the hyaluronansynthase gene in E. coli cells that lack UDP-Glc dehydrogenase and, therefore, lack UDP-GlcA. In this case, the expressed recombinant synthase cannot make hyaluronanin the live cell. However, when membranes from these cells, orthe purified hyaluronan synthase, are provided with UDP-GlcA and UDP-GlcNAc in vitro, then only the single hyaluronan synthase enzyme is requiredfor the synthesis of hyaluronan. Therefore, in order to observesignificant hyaluronan biosythesis, or a hyaluronan capsule, ina heterologous bacterium, one must also introduce into these cellsthe hasB and hasC genes so that the bacterium has the equivalent of the has operon. Cloning of the Hyaluronan Synthase Genes The Group A (spHAS) and C (seHAS) enzymes are 70% identical and are the smallest members of the hyaluronan synthase family, at 419 and 417 amino acids, respectively.3,7 Cloning of the Group A6 and then the Group C7 streptococcal hyaluronan synthase genes has allowed us to confirm, both biochemically and genetically, that only the hyaluronan synthase gene product (the HAS protein) is required for hyaluronan biosynthesis. Isolation of these genes provided a breakthrough because the enzyme coding sequences can be manipulated by a variety of recombinant DNA techniques to study the structure and function of these hyaluronan synthases. The finding that hyaluronan synthesis requires only a single gene product was initially surprising, since the hyaluronan biosynthesis process, as shown in Figure 2, is multifunctional and very complex. Many investigators, for example, expected that at least two proteins would be involved to catalyze the two glycosyltransferase reactions. We expected the enzyme to be larger than 〜48 kDa in order to perform the six functions shown in Figure 2. The streptococcal hyaluronan synthase is the first enzyme that makes a hetero-polysaccharide polymer to be studied in a purified state8. Figure 4 shows a simple model of how the streptococcal, and probably the eukaryotic, hyaluronan synthases appear to be organized in the membrane. The cartoon shows how the enzyme is arranged in the plasma membrane. The majority of the protein, including both the amino and carboxyl termini, is inside the cell. Only four of the synthase's membrane domains appear to pass through the membrane, giving only two small loops of the protein exposed to the extracellular side. Another two or more regions of the protein, including the large central domain, may associate with the membrane as amphipathic helices or reentrant loops that do not span the membrane (Fig. 4). Fig. 4　Organization of the streptococcal hyaluronan synthase in the membrane. The scheme illustrates the proposed topology of the polypeptide chain of the synthase. The amino and carboxyl ends and over 60% of the whole protein are inside the cell. Only about 5% of the protein is exposed to the outside of the cell. Two types of membrane domains are present: transmembrane domains that span the membrane (TMD 1, 2, 3 and 4) and membrane-associated domains (MAD 1 and 2) that do not go all the way through the membrane. The hyaluronan synthase is very compact and tightly folded, since even in the presence of the strong detergent SDS, the protein behaves as though it is only 42 kDa rather than 48 kDa. Reducing agents do not change this behavior, which indicates that disulfide bonds are probably not present. Protein chemistry studies and mutagenesis studies, in which we have altered the 4 Cys residues of seHAS or the 6 Cys residues in spHAS, are also consistent with this conclusion. There is a paradox or dilemma, related to the hyaluronan-transfer function, posed by the models shown in Figures 2 and 4 and the finding, noted above, that no protein other than the hyaluronan synthase is needed for hyaluronan biosynthesis, at least when the enzyme is solubilized in detergent. How can we account for the ability of this small protein to transfer the growing hyaluronan chain, which has some hydrophobic character2 but is mostly hydrophilic, across the hydophobic lipid barrier of the plasma membrane? Other membrane transporters that shepherd small molecules, like sugars, across membranes usually contain 12 or more transmembrane domains and create a pore. The hyaluronan synthase protein is not large enough, and does not have the necessary transmembrane domains, to form such a pore. So, how does it guide hyaluronan across the membrane? One solution to this hyaluronan-transfer dilemma would be if the hyaluronan synthase could only synthesize hyaluronan if it forms a dimer or larger oligomer, so that enough transmembrane domains from each hyaluronan synthase protein could be arranged to form a pore. To determine if the active hyaluronan synthase is a monomer or a larger oligomer, we used a technique called Radiation Inactivation Analysis. This approach uses radiation of very high energy to destroy the activity being studied. The two main principles of the technique are that: (i) a single hit of one high energy photon striking a target protein transfers enough energy to the target to cause it to fragment into many pieces; and (ii) the probability that a given dose of radiation will result in a photon striking a protein is directly proportional to the size of the target protein. Therefore, from the first-order loss of hyaluronan synthase activity as a function of radiation dose, we can calculate the size (mass) of the active enzyme species. Our interpretation of these results is depicted in Figure 5. We propose that cardiolipin molecules help the enzyme to solve the hyaluronan-transfer dilemma by creating a pore-like passage within the enzyme through which the growing hyaluronan chain passes. The lipid portion of cardiolipin could interact with the lipid bilayer and hydrophobic patches of the hyaluronan chain,2 while the acidic head groups of cardiolipin molecules could interact with the enzyme and hydrophilic portions of the hyaluronan chain (Fig. 5). Fig. 5　A model for the cardiolipin-hyaluronan synthase complex. The scheme depicts the close association of 16 cardiolipin molecules (the red dots) with one hyaluronan synthase protein to create an active enzyme. The figure represents a hypothetical plane parallel to the plasma membrane (purple) and viewed from outside the cell so that the cytoplasm (white) is seen through the enzyme. The growing hyaluronan chain would be transferred through this pore-like opening. The membrane domains of the hyaluronan synthase are labeled as in Figure 4. (i) Do the streptococcal hyaluronan synthases build hyaluronan from the reducing or the nonreducing end? Most previous data support the model that synthesis occurs at the reducing end with the growing hyaluronan chain always attached to UDP.1,3 As the question mark in Figure 2 indicates, however, we view this as still an open question, until more direct data are obtained to verify the presence of UDP-hyaluronan oligosaccharides. We are presently using the purified enzyme in conjunction with highly sensitive mass spectrometry methods to answer this question. (ii) Do the streptococcal hyaluronan synthases require a primer to initiate hyaluronan synthesis? A primer requirement is very unlikely, since the affinity-purified enzyme needs only the two nucleotide-sugar substrates to make hyaluronan.8 Nonetheless, until we know the details of how the enzyme assembles the first few sugars to make a short hyaluronan oligosaccharide, this is also an open question. If a primer is needed, we know it is not unique to streptococcal cells because the recombinant enzyme is active in other bacteria. Based on mass spectrometry, we also know that the masses of the purified seHAS and spHAS proteins are within 0.07% of the calculated values for a monomer.9 Because the active hyaluronan synthases lack any covalent modifications, the purified enzymes do not contain a covalently attached primer. (iii) Are any covalent intermediates produced during hyaluronan synthesis? It is possible that one or more sugars could be transferred to a functional group on the enzyme itself, as in the case of glycogen synthase, before being added to the growing hyaluronan chain. (iv) Are there actually two different sugar-nucleotide binding and glycosyltransferase sites or one site with alternating specificity? We believe the model in Figure 2 is correct, but it is possible that there is one general binding site that alternates its sugar-binding specificity so that the two substrates are recognized in an alternating manner. Similarly, do the two glycosyltransferase active sites reside in separate domains of the enzyme, or is there one general site, whose specificity for acceptor and sugar linkage changes in an alternating manner? Studies are in progress to quantitate the binding of the sugar-nucleotides to the enzyme and to identify the regions of the enzyme involved by using photo-activatable sugar-nucleotides. (v) Are there any drugs that specifically inhibit the bacterial hyaluronan synthase enzymes? If there are any mechanistic differences between the way the streptococcal and eukaryotic synthases make hyaluronan, then it may be possible to identify selective drugs that decrease infectivity or pathogenesis associated with the hyaluronan capsule. I have described recent research results that begin to answer some of the basic and important questions at the molecular level about how hyaluronan synthesis occurs. Five years ago, we reported the first cloning of a glycosaminoglycan synthase. Today, a family of hyaluronan synthases has been identified, and both nucleic acid and antibody probes are available to study the mechanism and regulation of hyaluronan biosynthesis in bacteria, mouse models and human disease. Most significantly, these molecular tools will finally allow investigators to study and understand the function and biology of hyaluronan in the many important processes described in this series. Acknowledgments Research from my laboratory described in this article was supported by the National Institutes of Health grant GM35978 from the National Institute of General Medical Sciences. I also thank Janet Oka, Coy Heldermon and Dr. Valarie Tlapak-Simmons for helpful comments in preparing this chapter.